The great solar potential of Iran is of growing interest, see e.g. this German study on PV in Iran (Dec 2015). ibee studer attended the Repower Conference at the Ministry of Energy in Teheran in November 2016; Intersolar organized another solar conference some days later. The current politics welcome foreign engagement and attractive feed-in tariffs are published; more details available from the Renewable Energy Organisation of Iran. In Juli 2017, a PV park of 20 MW got connected to the grid and several PV parks of up to 100 MW are under construction (Article PV magazine). Subsidies are not only discussed for renewable energies but are a reality on the fossil fuel and electricity market. Diesel is sold in Iran for about 3500 IRR resp. 0.1 EUR per liter, so electricity from a diesel generator costs about 1200 IRR resp. 0.03 EUR per kWh. If diesel would be sold on an international price level without subsidies generation costs would be more than 0.15 EUR/kWh. Anyway household electricity tariffs range from 400 IRR for a consumption below 200 kWh/month to 2700 IRR for the consumption above 600 kWh/month resp. between 0.01 to 0.08 EUR per kWh. A solar feed-in tariff of 8800 IRR/kWh resp. 0.25 EUR/kWh was published for systems below 100 kWp built in 2015; it decreased to 7000 IRR/kWh in 2016. Still attractive, however for a broad PV market development, feed-in tariffs have to be reliable and accessible without administrative hurdles.Studies in 2008 showed that PV investors preferred to invest in Germany with a lower feed-in tariff rather than in Greece with more sun, but prohibitive formal hurdles. Anyway solar power gets competitive to unsubsidized fossil fuels. 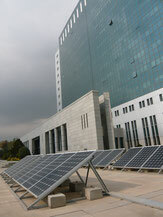 Big scale PV projects in India have solar generation costs below 0.05 EUR/kWh. It would be reasonable to have an electricity tariff around 3500 IRR resp. 0.1 EUR/kWh, so the utilities could operate without fuel subsidies and solar net metering might become cost covering without subsidies as well. 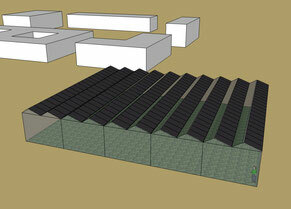 If PV isn't installed on existing roofs, I recommend to combine the solar covered area with horticulture. To grow vegetables in semi-arid areas, greenhouses with reduced temperature and evaporation are needed. Greenhouses partially shaded by photovoltaic enjoy a reduced the heat load and enable to use the land for food and energy. In 2004 I evaluated a concentrating PV system for selective greenhouse shading in my diploma thesis; in the meantime, several PV covered greenhouses were built in especially in Italy.